Awarded one of National Geographic’s 2014 Tours Of A Lifetime, this eco-friendly, culturally rich and appetizing adventure is the stuff that legends is made of. Blessed with an abundance of old world charm, alpine paradises, castles straight from storybooks, villages locked in time and a pastoral countryside so perfect it doesn’t seem real, this private guided journey through one of Europe’s best kept secret, Slovenia, packs quite a punch for anyone after eco-friendly adventures, wide open spaces and food fresh from the farm. Its stunning vistas and cuisine are just the start however as the truly life-changing moments are unlocked by the local people you’ll meet as you tour Ljubliana, Zgornji Brnik, The Logar Valley, Bled, Lepena, Livek and Brda. Immersion in the Slovenian countryside is the focal point of this hands-on tour, where you’ll experience beekeeping, making pottery, and cooking local dishes. No reviews yet for this trip. Browse other reviews below for Kensington Tours . Dervla Pinto at Kensington Tours did an excellent job in helping us develop a customized 21 day African Safari experience. From Nairobi to the Masai Mara, Serengeti, Ngorongoro Crater, Empakaai Crater, Victoria Falls, Chobe National Park and Cape Town all of the airline connections and guides, contacts, assistants and transfers were all there when they were supposed to be there. We had some outstanding guides in Masai Mara, Chobe and Cape Town. In fact our guide, Ben, in Masai Mara located all of the Big 5 in the first 2 1/2 days there! We were the only ones who saw a leopard and two cubs one morning. Kensington really did a first class job! Kensington Tours made our customized, private trip happen, and they did so perfectly! With a direct line to Chris, my travel agent, whom I called regularly to adjust our travel plans, I always felt taken care of. During our trip, I emailed Chris with a request to change a tour the night before it was scheduled, and the next morning, the tour guide arrived at our hotel fully informed of our request and adjusted the tour accordingly! In other words, for a nominal fee, using Kensington Tours is definitely the most ideal way to travel! I highly recommend them for a stress free, fabulous travel experience! Briana Kryger from Kensington Tours did a superb job in providing us with a private luxury 7 day family tour (7 people including 1 toddler) of the Golden Triangle of Andalusia, Spain (Seville, Cordoba, and Granada) in spring 2018. All of our accommodations, transportation/drivers, private tours were excellent and we couldn't be more pleased! Thank you for providing us with a family vacation that was the trip of a lifetime! Everything went smoothly and exceeded our expectations! The added excursions were informative and entertaining: the Pigmy Tribe, Community walk, coffee demonstration, women's group dancing and shop, waterfall hike. The flight to the Gorilla Treck was fun and our accommodations were comfortable and the meals delicious. The porters on the treck up the mountain were very helpful. Kensington delivers a high quality travel experience and has the flexibility to accommodate almost any requirements. Many organizations have fixed-price travel offerings which met some of our criteria, but Kensington was willing to work with us to create a more customized itinerary with gaps for us to explore and enjoy on our own. We enjoyed all of the guides, although I think we surprised our Montserrat guide with our desire to hike instead of visit the museum. (She adapted well). We would definitely contact Kensington again when we plan our next big vacation. Upon arrival at Ljubliana airport, you will be met by an English speaking driver-guide and transferred to your hotel in Zgornji Brnik. Ljubljana is the largest city and capital of Slovenia and is regarded as the cultural, scientific, economic, political and administrative center of the country. The city has a strong Alpine feel to it and the architecture underlines this impression - there is also a touch of the Mediterranean (thanks to its geographical proximity). Ljubljana was devastated by earthquakes several times. After an earthquake in 1511, the city was rebuilt in the Renaissance style, and after an earthquake in 1895 which caused severe damage, the city was rebuilt in Neo-Classicist and Secession (Art Nouveau) styles. The city's Baroque architecture was mainly influenced by Italian Baroque architecture. Enjoy a Slovenian culinary experience during your stay at the Dvor Jezersek Hotel. The family run property is the perfect backdrop to being initiated into the cuisine of Slovenia, its cultural heritage and the contemporary culinary arts, as your tutor draws on the wealth of the experience of catering and organising receptions that they have hosted inside and outside of Slovenia. Get ready to sample tastes of all the gastronomic regions of Slovenia and try individual dishes or styles of dish made by your own hand. Today you will drive with your English speaking driver-guide to Komenda to visit a ceramicist's studio. Continue to Kamniska Vistrica and enjoy a trek to Velika Planina. The herdsmen’s settlement is known as one of few the settlements of such size in Europe and attracts many visitors throughout the year. It is distinct by its typical architecture which symbolises Velika Planina. The roofs are covered with pine shingles, which extend rather low. The name of the cottage in the Kamnik part of Velika planina is “a herdsman hut” or “a shepherd’s home”, and a pine shingle is called “šinkel”. The settlement is revived every June, when herdsmen return to the settlement and tend to their cattle until September. Taste the dairy products or try a typical herdsmen’s lunch; sour milk and hard-boiled corn mush before you return by cable car. Continue your day with a drive to Logar Valley, one of the most beautiful Alpine glacial valleys in Europe which extends into the Kamnik-Savinja Alps from the north. A part of the Solcavsko region, tradition and nature have found harmony here, serving as a good example of sustainable development. The park has received a Future in the Alps Award from for the successful management of a protected area and is a stunningly beautiful natural area. Take in a full day of trekking in the Logar Valley today. Set among the over 2,000-meter peaks are sunny meadows and pastures, charcoal-makers’ and foresters’ cottages, wooden flumes for transporting logs, and picturesque natural features beside the springs and tributaries of the Savinja River. 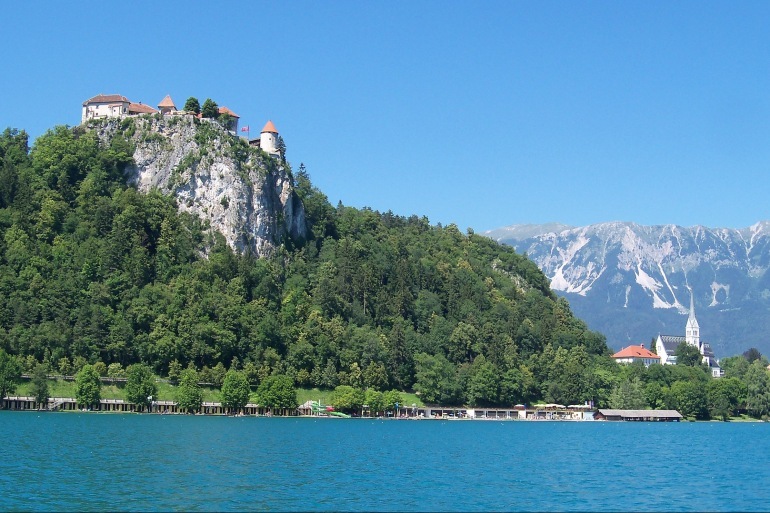 Start your day with a drive towards Bled to visit Bled Castle and Bled Island. The picture-postcard Alpine town of Bled was once the preferred choice of the Austro - Hungarian Empire’s elite. Its many charms include a medieval castle perched high on a rocky cliff, a scenic lake studded by a tiny wooded island, and the alpine splendour of the nearby Triglav National Park, a natural wonderland of glacial valleys, glittering peaks, Limestone canyons, ice-cold tarns, flowered meadows, Alpine forests, Pretty hamlets and cascading waterfalls. Continue with a visit to one of the beekeeper, learn everything about bees, and help in some operational activities. After lunch (included), take a ride with a boat to the Island of Bled and visit to the 16th century castle. Continue with a drive through Vrsic Pass a high mountain pass across the Julian Alps in northwestern Slovenia. This morning you will be driven to Bovec. This area is blessed with well-preserved and wild nature, mountains, the emerald river with its tributaries, the gentle and unique combination of Alpine and Mediterranean climates, and centuries of preserved tradition. Continue towards Soca Valley, dominated by one of Europe's most beautiful rivers. The Soca's stunning turquoise hue flows for about 100km against a backdrop of imposing limestone mountains cloaked in dense forests, lush meadows rich in wildflowers and a clutch of small towns and villages, including Tolmin, Kobarid and Bovec. Besides its rich history - the WW1 Soca Front was one of the bloodiest mountain battles ever known - the valley is now a hiking, kayaking, and fly-fishing haven with much of the area set aside as part of the Triglav National Park. Rafting on the Soca River has for many years been a hallmark of the Soca Valley. It is suitable for all swimmers over 15 years old. With highly trained and friendly guides you will descend the section between Boka and Trnovo, the most attractive part of the Soca. After lunch you will visit Kobarid a place of the biggest alpine battle in the World War I. One of the most renowned historical places in Slovenia was already inhabited in the Hallstat period and prospered in the Roman period. The town is mainly known for the aftermath of the Battle of Kobarid in October 1917, which placed Kobarid on the world map. Kobarid is known for the famous Battle of Caporetto, where the Italian retreat was documented by Ernest Hemingway in his novel A Farewell to Arms. The battle is well documented in the museum in the centre of Kobarid. During the Second World War, Kobarid was the centre of the liberated territory, called the Kobarid Republic. The Kobarid museum presents the story of these historical events and in 1993 it received the Council of Europe Museum Award. Kobarid is also the culinary capital of the Primorska region, since it boasts many excellent restaurants. Continue your journey with the drive to Tolmin to visit Tolmin Gorge. The chute on the Tolminka River is the lowest point in Triglav National Park and the longest chute in Slovenia. It is also among the deepest. The junction of the gorges of the Tolminka and Zadlascica rivers with their chutes is a unique phenomenon in Slovenia. The chute of the Tolminka River is about two hundred meters long and five to ten meters wide. The well known "Devil's Bridge” over which the Tolmin - Cadrg road passes arches sixty meters above the Tolminka, and above it there is the entrance to the Dante Cave. Enjoy your lunch (included )at the highest located ecological farm in Slovenia. Continue towards the very Western corner of Slovenia where beautiful wine growing region Goriska Brda is stretching on 72 square km. It extends trough the state border (Italy) from the river Soca on southeastern part to the Idrija river on northwestern part. The region ends with two old hills; Sabotin on East and Korada on North. Start your day with a visit to a local winery where you will have a wine tasting included. Continue your day with a drive towards Ljubljana. En route you will stop for lunch in Vipava Valley and at Postojna Caves the most visited caves in Europe. The Postojna cave system is the largest known cave system in Slovenia. A visit to a cave such as Postojna deserves full attention due to the diversity of shapes, expansive cave areas, stalactite and stalagmite formations and water characteristics. Admire its unique Karst underground world of beautiful formations of stalactites and stalagmites. You can also see an unusual and rare underground animal Proteus Anguinus - the so-called “human fish”. A visit to Postojna cave is a special experience, as an electric train takes visitors to their hour and a half circle tour visit to the cave. From train station inside the cave guides accompany visitors as they walk amongst magnificent creations of nature. Today you will have a sightseeing tour of Ljubljana. One of Europe's best-kept secrets, the ancient walled city of Ljubljana lies at the very heart of Slovenia and boasts a vibrant history that traces 3,000 years of Roman, Medieval, Baroque and Italian influences. A friendly and cosmopolitan city Ljubljana offers a broad selection of diversions that range from strolling the shimmering reaches of the Ljubljana River to exploring the formal gardens and fortified battlements of the city. There is also wandering the cobbled streets of the Old town and a bright café society to be enjoyed plus plenty of atmospheric bars, a broad range of regional restaurants and a host of cultural events. In the afternoon take a bike tour to Ljubljana moor, large marshy plain that is marked by an interminable mosaic of grasslands, woodlands and fields. It is a reserve for many species of birds as well as other animals and plants such as the checkered lily and the swamp tulip.